I met up with Alexis and Brian on a cold and windy Sunday in January, for their Rocky Mountain National Park hiking engagement session. We had decided on hiking the 6 mile out-and-back Loch Vale trail, that starts at the Glacier Gorge trailhead and climbs 1,000+ feet past Alberta Falls and to the frozen alpine lake Loch Vale. We set out a few hours before sunset, and kept passing hikers coming down as we were going up. I love hiking in this area, because you see a little bit of everything: there were people hiking down with snowshoes and trekking poles, and there were families on the trails in jeans and converse sneakers! When we reached the lake after an hour and fifteen minutes of hiking, we had it completely to ourselves. With wind gusts of up to 70mph, blowing snow around us and knocking me off my feet, we did not waste any time getting out on the ice and getting photos. The lighting was hitting the mountains behind Loch Vale at the perfect angle, and cutting through the snow and clouds creating some amazing sun flares. I could not yell loud enough to be heard over the wind, and so I let Alexis and Brian play around on the ice and just love on each other and try to keep each other warm. As we hiked back down again, we stopped at a small overlook by Alberta Falls so that Brian could pop a bottle of champagne for us! Poor Alexis got sprayed a bit, but we quickly finished off the rest of the champagne and hiked back down to our cars, grateful for the incredible hiking adventure we had just gone on. 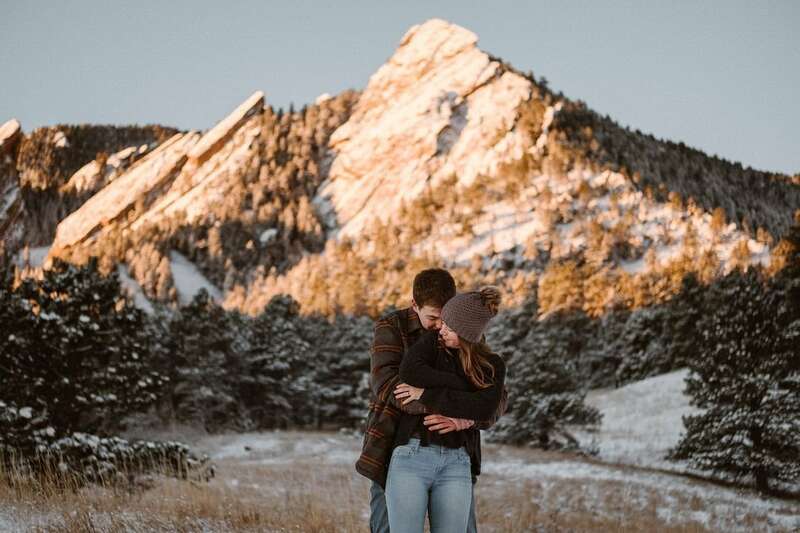 If you’d like to schedule a Rocky Mountain National Park hiking engagement session of your own, get in touch and let’s make it happen! You can also learn more in my Rocky Mountain National Park wedding guide. I met Nina through an all-women’s hiking group about a year ago. When my boyfriend and I got engaged I had no doubt that Nina would be the perfect person to capture our big day. My fiancé and I have a very playful relationship, we are truly each other’s best friends, but we are not at all people who exhibit PDA, we do not longingly stare into each other’s eyes, none of the stuff engagement photos are made of. Because of this, the thought of taking engagement photos was almost out of the question. We had zero desire to take all those sappy romantic photos that were just so not us. After some pushing from friends and family and talking with Nina we decided to give it a try, but only if hiking was involved. We both love to hike and Nina was more than willing to do a freezing winter hike with us! Nina found the perfect hike for us and we had a blast spending the day together doing what we love, hiking! Once I got our engagement photos back, I was absolutely blown away. She managed to perfectly capture our personalities and playful nature while also giving us breathtaking photos. I have had so many people reach out to me and say that they want to frame our photos for themselves, or that they look so epic they think we were in front of a green screen. I could not recommend Nina enough. She made us feel so comfortable, she tailored out entire engagement shoot just to us and she perfectly captured who we are as a couple. I am so thankful she will be photographing our wedding in September and cannot wait to see our wedding thorough her lens!